Earth Friendly Print Solutions for Conscious Consumers. According to The Environmental Paper Network, each ton of 40% post-consumer recycled fiber utilized saves 12 to 24 trees and provides a wood fiber savings of up to 310 percent. Paper makes up nearly 40% of the municipal solid waste stream. We're doing our part to recycle, reduce and reuse thereby cutting down on emissions in an industry where high carbon emissions is no longer justified. 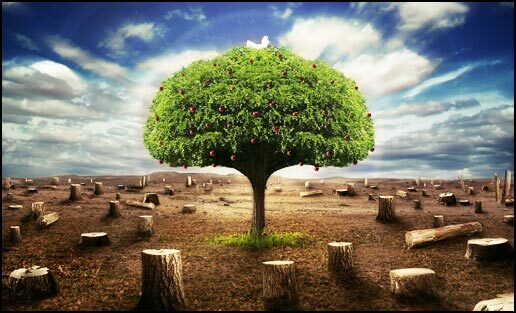 Benefits of sustainable printing include reduced impact on forest resources, reduced air and water pollution, reduced water and energy consumption, and the reduction of solid waste. Thank you for your support. Look around and notice the limited amount of resources that nature provides to us. Trees are certainly no exception. That's why we proudly offer you 40% pre- & post-consumer recycled papers available for only a minimal increase of cost..
Petroleum, the most common base used by online printers, emits a large amount of Volatile Organic Compounds (VOCs) into the air during the drying process. To make a difference in our local and global environments, we pledge to use only vegetable-base inks & solvents which are biodegrable and emit little or no VOC when drying. Our suppliers recorded VOC levels that are some of the lowest in the world and much lower than the required amounts set by the South Coast Air-Quality Management District. Because soy-base inks are water and not petroleum based, they are easily washable and cause less damage to the paper fibers. As a result, the soy printed recycled paper comes out brighter and more fit for reuse. Soy oil is more visibly clear than petroleum oil, thus you will see brighter more vibrant colors from soy ink printing.